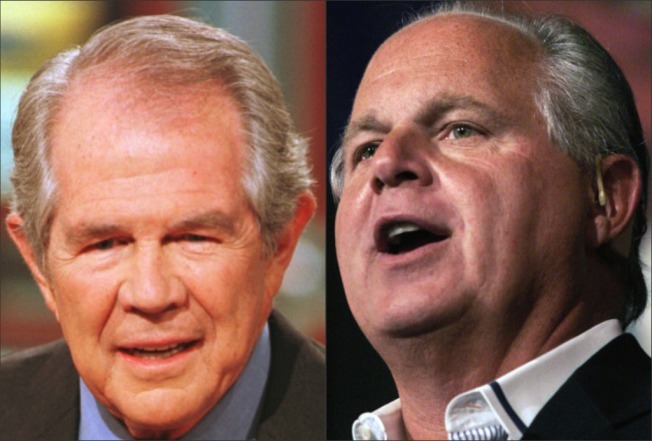 Pat Robertson and Rush Limbaugh have both popped off about the disaster in Haiti. Nice. When a tragedy like the one unfolding in Haiti occurs – death toll estimates are quickly soaring into the tens of thousands, and the capital of Port-au-Prince has been reduced to rubble – you can count on two things. One: that people will come together in a time of great suffering in order to help out those affected by the devastation. Two: That people will use the occasion to draw attention to themselves by saying something idiotic. It may be a blessing in disguise. There might be a massive rebuilding of that country… Something happened a long time ago in Haiti and people might not want to talk about it. They were under the heel of the French. Napoleon the third… whatever. And they got together and swore a pact to the Devil. They said, “We will serve you if you get us free from the French.” True story. Oh, it’s true? I did NOT know that. He goes on. And the devil said, “Okay, it’s a deal.” And, uh, they kicked the French out, the Haitians revolted and got themselves free. But ever since then, they have been cursed by one thing after the other. Desperately poor. That island of Hispanola is one island. Good point here by Pat. That one island is one island. It’s cut down the middle. On the one side is Haiti. On the other side is the Dominican Republican. Dominican Republican is prosperous. Healthy. Full of resorts, etc. Haiti is in desperate poverty. Same island. They need to have, and we need to pray for them, a great turning to God. This will play right into Obama’s hands. Humanitarian. Compassionate. They’ll use this to burnish their, shall we say, “credibility” with… uh… the black community, in both the light skinned and dark skinned black community in this country. It’s made to order for ‘em. That’s why he couldn’t wait to get to get out there. Could not wait to get out there. It’s true. I’m sure Obama woke up the other day and said to himself, “Thousands dead in Haiti? Just what I needed to win over the blacks!” Limbaugh and Robertson are, by their nature, provocateurs. Their job is to say outrageous things so that you will sit up and pay attention to them. And that job has served the likes of Limbaugh well for the better part of two decades now. Limbaugh says something crazy, liberals go nuts, and then Republicans cheer Limbaugh for driving liberals nuts. And on we go. Since the election of Barack Obama, there’s been a constant discussion of whether or not liberal bashers like Limbaugh and misguided bombthrowers like Robertson do the Republican Party more harm than good. I can only speak for myself on this matter by saying this. I am someone who, while socially liberal by almost any definition, agrees with a lot of conservative ideals: Personal fiscal responsibility, wariness of government-run enterprises, etc. I find liberal caterwaulers like Michael Moore and Barbra Streisand just as bad, if not worse, than Limbaugh. If [South Park creator] Trey Parker ran for office I’d vote for him immediately. And yet, I feel as if arch-conservatives like Limbaugh do their best to make themselves so astonishingly unlikable, so aggressively uncharismatic, that it’s nearly impossible to embrace their ideas. They go the extra mile to make you shake your head. Limbaugh and Robertson strike me as dinosaurs, men who feel the need to shout their aged opinions as loudly as possible in a world that grows younger than them by the day. The Party needs fresher blood, those who would challenge liberal ideas without being so repellent to any but their own kind. It could happen one day, but I don’t expect it any time soon.